The historic and handsome Penn Brewery anchors Troy Hill, but it's ready to expand to Downtown. Photo by TH Carlisle. Pittsburgh’s flourishing craft beer scene finally has an outpost Downtown. 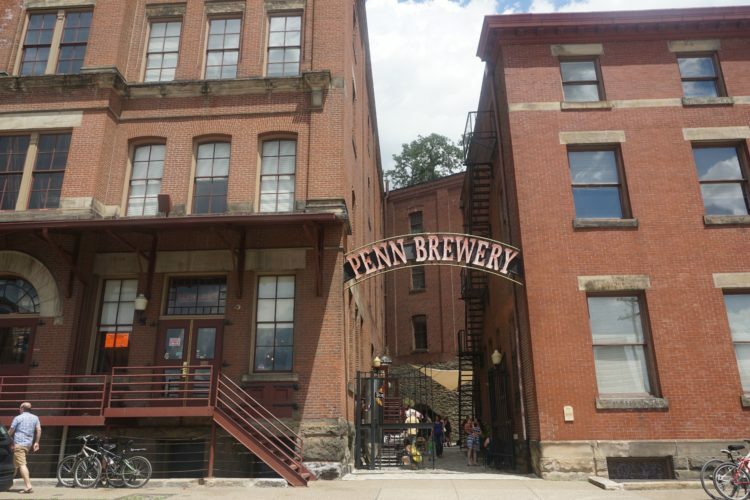 Penn Brewery, Pittsburgh’s oldest craft brewery, has signed a lease to open a taproom in late fall/early winter 2017 at 432 First Avenue in the city’s Firstside Historic District. Founded in 1986, the celebrated Troy Hill brewery has a 30-year legacy of brewing German-style lagers, like their flagship Penn Pilsner, in strict adherence with the Reinheitsgebot, or German purity laws. Penn co-owner and president Sandy Cindrich says that Penn didn’t have expansion plans until they were approached by Todd Palcic, owner of the new 1st Avenue Lofts. Palcic says he knew from the beginning that he wanted to offer the first-floor space to a local brewery, and as a North Side resident, he’s been a customer and fan of Penn for more than 20 years. “It’s a perfect fit,” says Palcic. 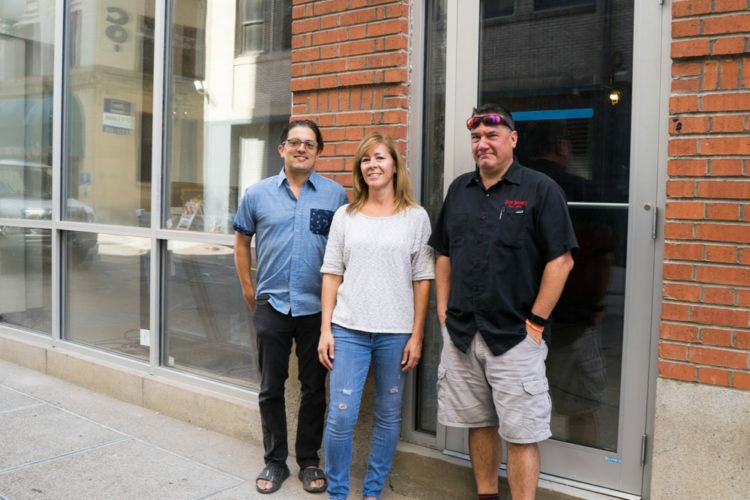 (L to R) First Avenue Lofts owner Todd Palcic with Penn Brewery President Sandy Cindrich and Food and Beverage Director Gene Mangrum at future site of Penn Brewery Taproom. Photo by Brian Conway. The taproom will operate under a 2015 PA law that allows a licensed brewery to open a satellite taproom location without an additional brewpub license. At 750 square feet, it will be a micro taproom for the microbrewery. 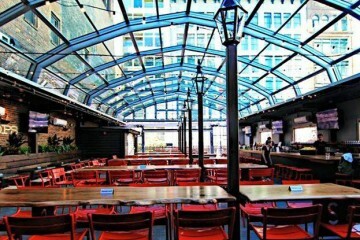 There will be occupancy for 30, not including room for takeout or outdoor seating. A bar will line one side of the taproom, with high-top seating along the other. Penn’s food and beverage director Gene Mangrum envisions a condensed food menu of 12 to 14 items, heavy on hot sandwiches and salads convenient for the takeout lunch crowd Downtown. The taproom will feature between eight and 12 Penn beers on tap, including offerings from their new pilot batch system, as well as a full bar with PA-made wines and spirits. Six-packs and growlers will be available as well. Project architect David Roth of The Downtown Design Company cut his teeth inside the building as a graphic arts student when it still housed Graphics Arts Color Corporation. 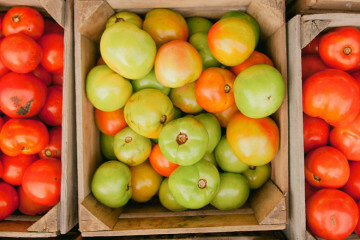 He believes that Firstside has the potential to emulate Penn Avenue with nearby residents feeding into the numerous local businesses. If all goes according to plan, the taproom will have its soft opening the Friday after Thanksgiving.